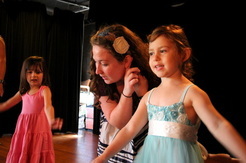 Compass Creative Dramatics offers a variety of programming and events to stretch creativity and bravery muscles for all the creative kids in your life. Compass Creative Dramatics offers a variety of 45-minute action-packed classes for the tiniest performers and explorers in your life! We help lay foundations for cooperation, empathy, social skills, and creative art appreciation. ﻿This unforgettable one-week experience brings together the excitement of mounting a fully-staged musical production (sets! costumes! props!) 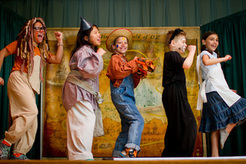 with theatre games and activities that stretch kids' creativity and bravery muscles. When the curious Darling children befriend a mysterious boy from a distant planet called Neverland, they never dream that they'll soon be fighting alongside him, battling injustices and turning the delicate balance of this faraway world on its head. Join Peter, Tinkerbelle, Wendy, Michael, John, and all of the Neverlanders as they fight for independence from the callous Captain Hook!